See the note further down on this page! Copenhagen smiled when MS Gripsholm sailed off on her maiden voyage to U.S.A. It was cloudy and raining when we left the Swedish maritime city of Göteborg, on Tuesday, May 14, but after a while the sun appeared, and when we arrived in the royal Danish capital, the evening sun had a friendly mirth. Approximately 200 Danes embarked in Copenhagen, mostly young families, several emigrating to Canada. One family had 5 small children, from 2 months to 6 years old. There seems to be an emigration wave across Denmark. But of course there are Swedes and homeward bound Americans on board as well. There are also Norwegians, Finns and Italians. In total, we are 650 passengers and 350 crew members living on board this great new "home away from home". Like a secure and friendly patron, the Commander, Gunnar Nordenson, presides over the bridge. I had a long talk with him yesterday. He showed me the excellent new Decca radar equipment, the most advanced there is in the world. 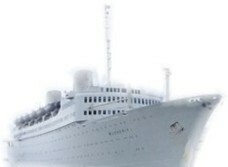 It is supervised by a British specialist on this maiden voyage. There is an additional radar system on board as well. There are always 2 men on look out, night and day. "The passengers' well being and safety has been our motto for this new ship, as with all the others", says Captain Nordenson. I accompany him to his spacious cabin, where he won't spend many hours, as he will mostly be on the bridge. We are discussing the first Sunday Worship Service to be held in the ship's auditorium, when the new Hammond organ will be used for the first time. The food surpasses first class rating. "I have never before in my life had such good food", one fellow passenger said. However, personally, I would prefer to see a greater variety of nonalcoholic beverages. 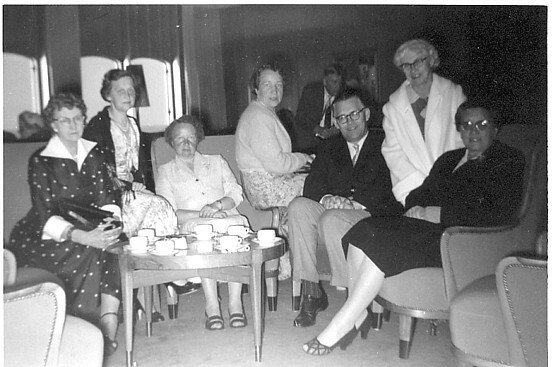 passengers in the Gripsholm's Main Lounge, May 1957. The Worship Service begins at 11 a.m. (we are already 4 hours ahead of you back home) for both 1st and tourist class passengers in the beautiful Auditorium, where an altar has been placed. We sing "Rock of Ages" (Klippa, du som brast för mig) and I can hear the words being sung both in Swedish and English. After the Service I meet many new friends. There are Lutherans, Methodists, and Presbyterians. It is a very special ecumenical moment in the middle of the Atlantic. The voyage has been like a dream. Sun, rain and warm winds. We saw a group of icebergs at safe distance. Today the sun is shining from a clear blue sky, and we will soon arrive in New York. Upon browsing the internet I just came across the article about the Gripsholm's Maiden Voyage. I was intrigued by the comment about one family embarking in Copenhagen with 5 small children. Well, I was the oldest of those children!! We immigrated to Alberta, Canada where my parents had three more children for a total of eight. Our parents are both deceased and the sister that was 2 months old at the time passed away last year at the young age of 52 years. I have a few memories of the trip, however, I was too young to remember much.